This painting was done to bring awareness to the rise of anti-Semitism worldwide and to defend Israel, the only Jewish state. I put my heart and soul into this project. Anti-Semitism had existed since the beginning of the Jewish faith. There is growing anti-Semitism around the world now in 2016. There is also an ongoing trend amongst young people that think it’s “cool” to hate Israel. I want to shed some light on this subject and also on the State of Israel. One of the core propaganda messages is that Israel was stolen from the Palestinians. Israel was not stolen; Zionists bought the land from the Ottomans and the British who ruled it at the time with the Jewish National Fund. Most of the land that was purchased was mostly uninhabitable swamplands, which were industrialized later from scratch. While many countries within United Nations abstained and many objected, enough countries supported the partitioning of a largely uninhabitable piece of land to allow for the creation of a Jewish homeland. The final vote came out in favor of creating the State of Israel on November 29th, 1947. However, since the formation of Israel when the British Mandate of Palestine gave up power in 1948, it followed by an all-out attempt by Arab states surrounding Israel to expel the Zionists, and Israel had to defend itself. In today’s world Israel is always being politically attacked by most of the civilized countries. There is also a notion that Israel is working only for her own interests. With enemies surrounding Israel from all sides, and countries like Iran that are dedicated to Israel’s destruction and are now on the verge of nuclear power, can you really blame Israel for trying to stay alive? In today’s world, Israel is being blamed for practising self defense, although it’s completely acceptable for other countries. Also, how Israel “oppresses the Palestinians” was a big topic in European countries, who blame Israel for not making peace with the Palestinians, whose goal is the destruction of the Jewish state. It’s a lie to say that Israel is an apartheid state when people of all religious faiths, including Christianity, Judaism, and Islam, all co-exist within the state. Israeli hospitals have Jewish and Arab doctors working side by side and they treat Israelis and Palestinians equally. However, if the roles were reversed, an Israeli Jew would never even make it to a Palestinian hospital, let alone get treatment. Israel is the only power that can prevent another Holocaust. 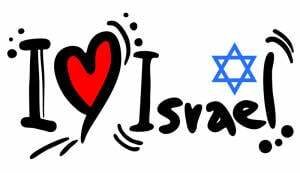 It is a haven for the Jewish people, to prevent complete annihilation with the world that hates Israel and Jews, as well as justifies hate against Jews with anti-Israel and anti-Semitic propaganda. My painting, “Never Again,” is based on an old 1940s photograph because I wanted to viewers to connect with a real-life event that took place, opposed to staging it with models. This was a very low-resolution, gray scale photograph. My plan was to bring this event back to life with as much detail as I could possibly represent in this image. (This painting is much more detailed than the photograph, which is very pixelated.) It shows Holocaust victims getting off of a train to march to their deaths in Birkenau concentration death camp – the part of Auschwitz, where they executed prisoners. I made this painting with a graphic element in mind. Everything was painted in gray scale except for the yellow stars of David, which pop at the viewer. This modern tragedy happened \not so long ago, however, the world seems to forget very quickly and chooses the easiest scapegoat – the Jews – to blame for many of the world’s problems. Six million victims of the Holocaust were Jews; they were the primary target of Hitler and the Nazi Party. That was half of the world Jewish population at the time. Other groups that were persecuted by the Nazis were: homosexuals, Jehovah’s witnesses, Polish people, Gypsies, black people, Soviet prisoners of war, and the disabled. I want to say that I support existence of Israel, and did this piece to stand up for what I feel is right to promote awareness on this topic. I did this painting in my attempt to put out my statement on the subject matter so it never happens again. The only way it won’t happen again is if Israel will continue to exist. This piece is also a commemoration to ALL the victims of the Holocaust. I am stating all of this in an unapologetic manner. NEVER AGAIN! I would also like to share how this work was inspired. When I was about 14 or 15 I visited Germany with my father, and met up with my aunt, uncle, and cousin, who currently live in Israel. One of the days I visited Dachau memorial park with my father. (Dachau was the first concentration camp in Germany, which was converted into one from a train station.) I got an entire tour and an explanation firsthand of the kind horrible events that happened there. I also felt perturbed when I saw people standing in front of gas chamber and ovens taking photographs with a smile or selfies for social media. When I was about 16 I had a vivid nightmare. I was running through the streets of Europe, somewhere in Germany or Poland. There were Nazis running after me with dogs. I jumped off a bridge that had trees and a forest underneath. After the jump, I broke my legs. Suddenly, moments later, dogs tore into my body. I felt the pain in my dream as if it was really happening. I cried in my dream, “God, please help me.” I then woke up in the middle of the night in a cold sweat. Where the dogs bit me, my body parts felt numb. Another Holocaust dream I had, which actually inspired this painting happened right before I began working on it. It was the morning of Friday, July 17, 2015. I dreamt of Holocaust victims getting off a train in Auschwitz. In the background was Oscar Schindler, observing what was going on. When I woke up , I decided that it was what I needed to paint. I then began to do my research and started on the project that same morning. This painting was done to bring awareness to the rise of anti-Semitism in Europe and around the world and to defend Israel, the only Jewish state. I put my heart and soul into this project. We live in a strange world where the most beloved person ever was a Jew who lived 2000 years ago, while the most hated group of people are Jews. Eugene Kuperman was born in Kharkov, Ukraine and now lives in Southern California. He has created over 400 pieces and thousands of sketches, and his work is in many private collections. In recent years he has been works of social commentary in order to educate, enlighten, and promote change in society. Eugene Kuperman is a graphic designer and a listed artist. His work has been published in various art books, magazines, and newspapers.